As political slogans go, “Better Skills, Better Jobs, Better Wages” is in many respects… suboptimal. Yet I do think that it represents mainstream Democrats’ vision in an authentic way. They agree with the Republicans that all of life should be a ruthless competition, for all eternity. They agree that the individual should be responsible for every decision and outcome, as a matter of principle. The difference is that the Democrats want to set things up to slightly decrease the chances that you will irrevocably screw up, whereas the Republicans want to leave losers to die. Hence Democrats come up with a plan whereby people are forced to buy health insurance, while the Republicans openly muse about how maybe having a preexisting condition means that you are a bad person who deserves to die. On the job front, Democrats want to help people become more competitive on the job front, while Republicans think colleges should be burned to the ground. What we’re dealing with here, fundamentally, is two different strategies for bringing the job market into equilibrium and restoring America’s global competitiveness. The Democrats are dangling the prospect of short-term advantage for particularly industrious individuals, but the end logic of their plan is to commodify those in-demand job skills, converting ever more occupations into disposable cheap labor. Democrats are opening up the possibility of economic survival to more people, but not really increasing the number of slots available. The Republican strategy, by contrast, appears to be to let the dying communities just die — not to drive up wages for those left behind, but apparently out of a sheer desire to make sure that the losers lose. It’s as though the Democrats are Chigurh from No Country for Old Men: you’re most likely going to die, but you do have the option of a coin toss. The Republicans don’t offer the coin toss. Which one is better? The Democrats, obviously! But if you were someone in a dying community that had been starved for jobs for a generation, the kind of place where everyone leaves if they can, would you bother getting up in the morning to pull the lever for that option? Michael Haneke’s film Funny Games portrays a bourgeois family that is gradually destroyed by two anonymous men with an appetite for cruelty. In the face of these destructive nihilists, all the victims’ instincts — negotiation, compromise, and submission — serve only to prolong their suffering. The invaders have no long-term goal, hence there is no “getting it over with” or “meeting their demands.” They cannot be paid off or otherwise satisfied. All they want is dominance and control for its own sake. We are now entering into the Funny Games presidency. There have been many attempts to make sense of Trump’s beliefs and strategies, and in the thinkpiece literature, he seems to alternate between being an undefeatable genius and an incompetent child. The truth, in my view, is that he is something like a genius in one very narrow field: asserting dominance. The baseline condition for that dominance is that Trump should be the center of attention, with everyone reacting to him. As long as people are responding to him, he has control over the situation — and as long as he has control over the situation, there is no way out, because he has no other end goal. He cannot be bought off or satisfied and made to go away. As soon as he recognizes that you want something, that gives him leverage over you, and since he is a total nihilist, there is no reciprocal leverage over him. He will only give to you in the context of maintaining his dominance and control. Hence his tendency to tell his followers “what they want to hear,” which always turns out to be Trump’s brazen lies. What is most shocking in this context is how casual those lies most often are. If we review the infamous speech where he proclaimed that all Mexican immigrants are rapists, he does not particularly emphasize that remark. It’s as though he’s “just throwing it out there,” almost like he’s brainstorming. Trump uses language as a weapon. His utterances are all tactical moves to maintain initiative and destroy his opponents. Hence his tendency, on display last night, to simply throw an accusation back at the accuser. Trump won the election under dubious circumstances, so he hallucinates a situation where Hillary won the popular vote under dubious circumstances. Trump is one of the most corrupt men alive, so he coins the nickname Crooked Hillary. We could multiply examples. The goal is not counterargument — I don’t know if he expects people to take his words literally, or indeed if he’s even thinking consciously to that extent — but to make argument impossible, to take away that weapon from his opponent. If there is no truth, then everything returns to his home territory of aggression and dominance. He seems to know how to control himself — for instance, to use flattery as he did in his NYT meeting, or to let his opponent twist in the wind, as he did after the Comey revelations. He knows how to string people along and give them false hope. But he cannot sustain those behaviors because they are not where he lives. They are indirect means to dominance, and he prefers to achieve that goal more directly. How does one deal with Trump? If we stick with the Funny Games example, it seems that the only solution is not to let him into your house in the first place. Once that initial bridge is crossed, he may come to control reality to such an extent that even extreme action proves ineffective. Last night we went to see 2001: A Space Odyssey, which is part of the 70mm Film Festival at the Music Box. I’ve seen the film several times before, but never on the big screen. One thing that struck me was how much more patient I was with the pacing when seeing it in the theater as opposed to seeing it at home — it works so much better if it has the advantage of absolutely dominating your senses. This was especially the case for the final section, “Jupiter and Beyond the Infinite,” which is also the most puzzling part of the film. Some details were also more legible than on our almost comically small television — for instance, the brand names that appear seemingly everywhere. The space station is a Hilton, all the computers are IBM, even the food processor is Whirlpool. This is a “believable” detail from our perspective, but in context, I think it’s meant to be jarring in its very familiarity — we’ve reached out to touch the stars, space travel is now routine, but everything is the same. Calling home and leaving a message with your cute toddler is the same. Meetings are the same. Small talk and gossip are the same. They even pause to take a group photo in front of the monolith! In my opinion, Tarantino’s greatest gift as a screenwriter is his ability to generate tension by crafting genuinely open-ended set pieces. For me, the locus classicus is the scene in True Romance where James Gandalfini is interrogating and torturing Patricia Arquette. Even though Patricia Arquette is one of the primary characters, the viewer gets the sense that she really could die — not only in the moment, but in the context of the film as a whole. The outcome is not preordained, and that contributes to the triumph when she finally does overcome him. There are countless setpieces like that in the films Tarantino actually directed. In fact, it’s fair to say that Tarantino is fundamentally a creator of setpieces rather than a builder of large-scale narratives. This is clearest in his most successful film, Pulp Fiction, where the different segments take place in the same narrative world without necessarily cohering into a single plot. The structure of Inglourious Basterds is very similar — everyone winds up in the same place in the end, but that represents the convergence of two separate plots to kill Hitler rather than the culmination of a unified narrative. When he needs to create an overarching plot, Tarantino tends to rely on genre conventions to do that work for him, as in Django Unchained. And this brings me to my disappointment with Hateful Eight: there’s not enough of that Tarantino tension. The only classical setpiece is the face-off between Samuel L. Jackson’s character and the Confederate general. That scene, it seems to me, could have gone either way. Everything else is too preordained. You know everyone is going to die, and you don’t have enough investment in most of the characters to be genuinely curious as to how. Worst of all in this regard is the flashback that reveals the initial setup — it’s the opposite of a Tarantino scene, because you know precisely what will happen. I’m willing to be convinced that Tarantino is doing all of this on purpose in the service of some greater aesthetic goal. Indeed, I hope that someone has a theory in that regard, because it would help to “save” the film for me by making it interesting — but I’m just not sure anything could make it seem as intuitively entertaining and enjoyable as Tarantino’s best. Making a Star Trek film was always a strange project. Both the original series and Next Generation were meandering affairs, with few clear villains and many episodes with confusing premises. The movies have been many different things — sometimes fan service (Search for Spock), sometimes glorified children’s fare (Voyage Home), and sometimes little more than a way to give paying work to series regulars (The Undiscovered Country, Generations, Insurrection, Nemesis). There are films in the franchise that attempt to do essentially a really long episode with better special effects, above all the first (The Motion Picture), which closely followed the plot of an original series episode (“The Changeling”). And sometimes they’ve been embarrassing indulgences (The Final Frontier). At their best, though, they have combined a clear villain with a conscious awareness of the questionability of the undertaking. Why do the Gremlins love Snow White? It’s a strange moment. The Gremlins, having eaten after midnight and turned from teddy bears into evil reptilian creatures, find themselves in a movie theater. Suddenly, Snow White starts playing — and they are transfixed. 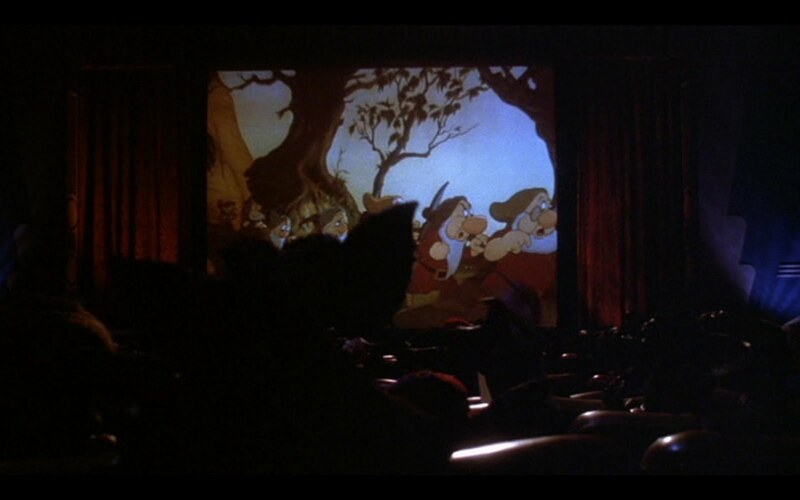 They all sing in unison along with the seven dwarves: “Hi ho!” Indeed, their love of Snow White proves to be their undoing, as their absorption in the movie is what ultimately allows them to be defeated when the protagonists start a fire, burning down the theater. In the essay “Utopia as Replication”, Jameson suggests we consider Walmart as an example of how “the most noxious phenomena can serve as the repository and hiding place for all kinds of unsuspected wish-fulfilments and utopian fantasies”. Jameson intends this as a bit of a provocation, but I wonder if Walmart isn’t actually too easy a choice for the “paradoxical affirmation” of “what is most exploitative and dehumanizing in the working life of capitalism”. Walmart’s vastness of scale and remorselessness give it an aesthetic alibi, allying it with a tradition of modernist creative destruction which is likely to be attractive, at least to the sort of people who read Jameson. To really follow through Jameson’s project of unearthing the “utopian impulse”, we need to consider an aspect of capitalism that is not just exploitative but also in bad taste; for a certain strand of contemporary opinion, that would be “twee”, the kind of cutesily-retro faux-petit-bourgeois capitalism of cupcake shops and Cath Kidston.